An absolutely classic part of the media narrative on Grenfell Tower is how "foreign" fire prevention rules are that much tighter, thus demonstrating that this is a home-grown affair, permitting open attacks on Tory "austerity", without the complications that might attend a more complex problem. In the case of the Guardian, the Germans in particular get the accolade for having the "tighter fire-safety rules for tower blocks", the paper quoting Frankfurt's fire chief, Reinhard Ries. He is said to be "appalled" at the fire at Grenfell Tower, with the paper having him saying that Germany's tighter rules "meant that a similar incident could not happen there". Actually, at this particular moment and for quite a while previously, German and UK laws on insulation standards for high-rise blocks have been exactly the same. Both administrations require the materials to be non-combustible. Technically, the standard is "limited combustibility", amounting to Class A2, EN13501. In the German instance, this actually enforced, as EN13501 is currently the only standard applicable (apart from the equivalent local standards). But that does not mean that Germany does not have an insulation problem – it certainly does. 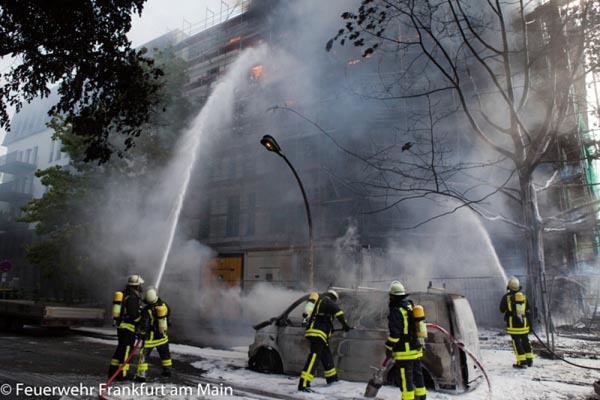 As a result of the huge emphasis on climate change and the push for better energy efficiency, the Germans have been suffering an epidemic of what they call "thermally insulated facade" fires. Ironically, it is Reinhard Reis, fire chief at Frankfurt am Main, who is taking the initiative. After a major incident on his own patch in May 2012 (pictured), his department set up a website inviting reports from the rest of the country on this type of fire. So far, it has listed over 100 incidents, recording eleven deaths and over 100 injured. So concerned are fire professionals that three of their leading bodies have recently got together in the wake of Grenfell Tower to issue a position paper, where they complain of the "extremely fast spread" of the fires, and the way the facades enable the flames to spread into higher stories. Reinhard Ries himself has made a statement, calling for Grenfell Tower to be treated as "a warning shot", hoping that fire safety "will finally be taken seriously". He is demanding better fire protection for buildings in Germany, but explicitly for houses below the high-rise limit, between 7 and 22 metres high. But what is especially significant is that the Germans seems as unaware of what's going on as the British. They note that their Building Regulations require external walls to resist the spread of for a "sufficiently long" period – remarkably similar in phrasing to the British code. As with the British code, "sufficiently long" is defined by reference to EN13501, with Class B sufficient for lower levels. But, as the Irvine experience told us in 1992, conformity with a materials test is not sufficient to indicate the resistance of the complete fabrication – which can be dangerously vulnerable to room fires breaking out of windows. Going back, we see that, in June 1994, the Commission initiated the process of creating a single, harmonised standard for fire testing, based on the Single Burning Item (SBI) test, with expectation that CEN/CENELEC would get down to work by the November. By 1999, the House of Commons Select Committee was settling on the need for a system test – what was to become BS8414 and, by May 2003, on the basis of a consultation which had started in 1999, the need at a European level for a large-scale (system) test had been established. In the meantime, in May of the year 2000, the Commission had promulgated Commission Decision 2000/367/EC, setting up the "classification of the resistance to fire performance of construction products, construction works and parts thereto", locking in EN13501, the use of which became compulsory for all Member States. From this time onwards, Member States could determine the performance levels of construction products in relation to fire only within the classifications adopted at Community level, as defined by EN13501. For reasons that are very far from clear, although a new draft mandate published in 2004, it was never formally issued and in 2005 the Commission stopped work completely on producing a comprehensive testing process. Further work on a Europe-wide standard was not to get under way until 2007, on the basis of the original 1994 mandate, after the publication of a narrative report on the workings of national systems. By 2013, it was further confirmed in a technical report by EOTA that a large-scale system test was needed. The existing testing procedure provided "no information on the fire-resistance behaviour of an exterior wall cladding system". Yet, despite this – with the work for Grenfell House open for tender in 2013 - the discussions on a new standard were only just starting up again. By May 2015, preferences were being expressed for a single assessment method, leaving the Commission in August 2016 to offer a tender worth €340,000 for a contract to develop "a European approach to assess the fire performance of facades". In January of this year, the contract was awarded - one of the contractors being the BRE – with the work expected to finish at the end of 2017. Thus, 23 years after the process of framing a harmonised fire standard had started, we are to see a final draft produced. It must then be adopted. Meanwhile, tired of waiting for a new standard from the Commission, Germany – it seems – is jumping the gun. Draft, revised technical building regulations are to include a German version of the system test devised by the BRE, which became BS8414. Its version will be DIN 4102-2, ten times less powerful (in terms of heat load) than the British Standard. For that reason, it is being boycotted by the German fire unions. They want a more rigorous test. The Germans do seem to have learned something from the UK experience, though. Users will be required to show why a system test rather than the EN13501 materials test should be used. Largely, though, the Germans, if they adopt this system, will be in a similar position to the UK, running two test regimes side-by-side – with the same potential pitfalls. Earlier proposals had suggested a three-tier approach, with EN13501 used to approve materials used in low-rise buildings, DIN 4102 for medium-rise, and BS8414 for high-rise. That may be what we get for a European standard – 23 years in the making and coming into force just a year before we are scheduled to leave the EU. If the effect is to make BS8414 mandatory for every single type of cladding installation used for high-rise buildings, it will substantially add to testing and approval costs, but it will only bring us into line with Dubai – and China, which is basing its high-rise approval on BS8414. Bizarrely, because the UK is inside the EU, it cannot rely solely on this standard, while China, because it is not in the EU, has no restrictions. For all that, the UK media seems totally oblivious to these undercurrents, with The Times only just discovering that Reynobond PE has an Agrément Certificate - something we reported two weeks ago - without understanding the significance. With The Times also citing Konstantinos Tsavdaridis, the associate professor of structural engineering at the University of Leeds, telling us that the UK needs to adopt system testing, when we have been using it for over a decade, and with the Guardian denying any EU involvement in UK Building Regulations, and misrepresenting the German situation, we have a huge chasm between reality and what is being reported. As with Brexit and much else, it seems that reporting accurately and intelligently on the detail of this issue is beyond the capability of the legacy media. It's not so much that they won't do it properly – they simply can't. They can do the human interest, and emote with the best of them, but when it comes to the detail, they're not there.